DVC97 is part of the 2017 Super Treasure Hunt set and is 10/10 in the Then and Now series. It has Spectraflame gold paint with black stripes on the hood and sides. 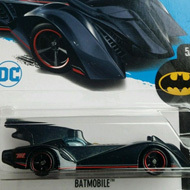 “TH”, “SRT”, and the Hot Wheels logo also appear on the sides. The car has tinted windows, a black interior, black Real Rider 10-Spoke wheels with yellow rims, and a black plastic Malaysia base. 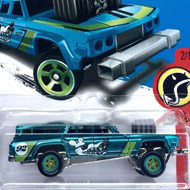 Note: Loose versions of the vehicle are available with a variety of colors. 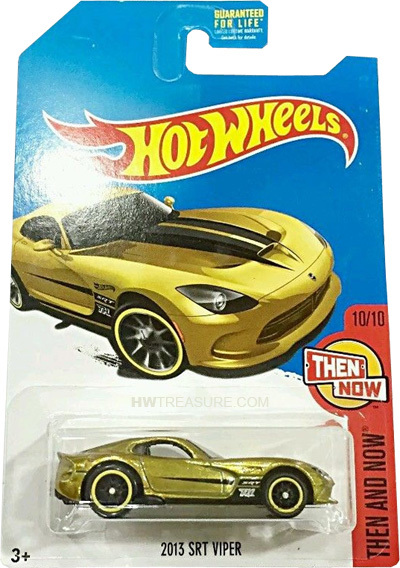 This vehicle can be found in mix “J” of 2017 Hot Wheels mainline cases. The 2013 Viper SRT made its debut in the 2012 New Models series. It is based upon the actual sports car that features a long hood, rearward cabin, and an all-aluminum V10 engine.